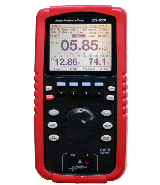 SBS’s portable impedance/voltage tester is the fastest and most accurate impedance tester available today. In just seconds, the unit tests and records a battery's impedance, voltage and temperature. The unit will give a Pass / Warning / Fail indication. Battery management software is included with each testing kit which will help the user easily identify bad cells, create reports, save data and ensure the integrity of backup power systems. 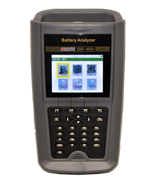 With a large 3.8” backlit LCD screen, a straightforward menu, and Excel-based software, the SBS-6500 is the most simple battery impedance testing unit on the market to learn and operate. Routinely testing a battery's impedance assures the reliability of backup power systems and helps prevent unexpected failures. Our digital battery testing kit will come complete with everything needed to test all types of batteries as well as the software necessary to create reports for trending purposes and to satisfy NERC PRC-005 requirements and IEEE recommendations. Impedance testing is commonly done in the utility, telecommunications, UPS and transportation industries. For assistance, please contact our Test Equipment Sales / Technical Support department.